When Will We Finally See the Death of the Phone Book? Information is everywhere — in our homes, on our phones, on our televisions. We've got web-based city guides like Yelp and Citysearch, location-based apps like Foursquare and Gowalla, and search engines at our fingertips to help us track down any lost address, new phone number, or updated business listing we need. And yet, every few months the phone book people slam a four-inch-thick tome down on our doorstep. In fact, half a billion phone books are printed and delivered in the U.S. each year, according to The Daily Green's Jeff Yeager. With all the free, paperless alternatives to Yellow Pages available in increasingly convenient forms, why do phone books still exist? Small, local businesses with limited budgets have narrow advertising options. Whereas the Internet provides myriad cheap or even free ways to advertise a local business (Adwords, Yelp, Blogs, etc), a busy local plumber simply may not be savvy enough to take advantage of them. Enter the Yellow Pages salesperson, a man or woman armed with a quota and a mouthful of statistics like '8 out of 10 calls come from Yellow Pages.' Because phone books have typically been cost effective advertising forms for small businesses, it's easy to justify the expense to renew an ad each time the sales rep comes calling. And since the sales rep comes to you, it's often easier to spend your budget on a phone book ad than on Google Adwords or something that requires proactivity. It's difficult to measure the return on investment of a print ad. That's one of the reasons the print industry has been so profitable over the past few decades: advertisers don't know where their money is being wasted. The bottom line is that even if people don't use phone books, as long as businesses are paying money to advertise in them, those big books will be printed. Mobile applications like Gowalla, Foursquare, and Where have introduced a powerful (and much more pocket-friendly) alternative to Yellow Pages, and to Yellow Pages advertising. Smartphones allow users to access nearby business listings based on GPS coordinates, view reviews from peers, and map out directions to any location. This combination offers a far more powerful set of local search tools than a simple phone book. Despite these advances, Nielsen reports that fewer than half of cellular phone owners have smartphones today. There are more than two phone books printed each year for every American citizen, so it will be a few years before smartphones overtake phone books in terms of market penetration. Online listing behemoth Yelp is a searchable, filterable directory of business listings available on the web and mobile. Yelp says it receives about 39 million visitors per month. That's a big number, yet still a fraction of the U.S. population. Furthermore, Yelp is only in roughly 50 cities so far, so it's got a long way to go before achieving the local reach of the phone book industry. Google, on the other hand, with its maps, street view, targeted Adwords advertising, and local business listings, is pervading across local markets all over the world. As Internet access becomes more ubiquitous, perhaps search engines will eventually be the death of phone books. Will Phone Books Ever Die? Even if phone books become technologically obsolete, they'll continue to live on as long as advertisers are willing to pay for placement in them. Not only will the vast majority of consumers have to stop using phone books in favor of web and mobile tools, but small businesses will have to figure out how to measure the ROI of their phone book investments in order for phone books to stop being profitable enough to print. So when will we actually see the death of the phone book? It may not be until we run out of trees. 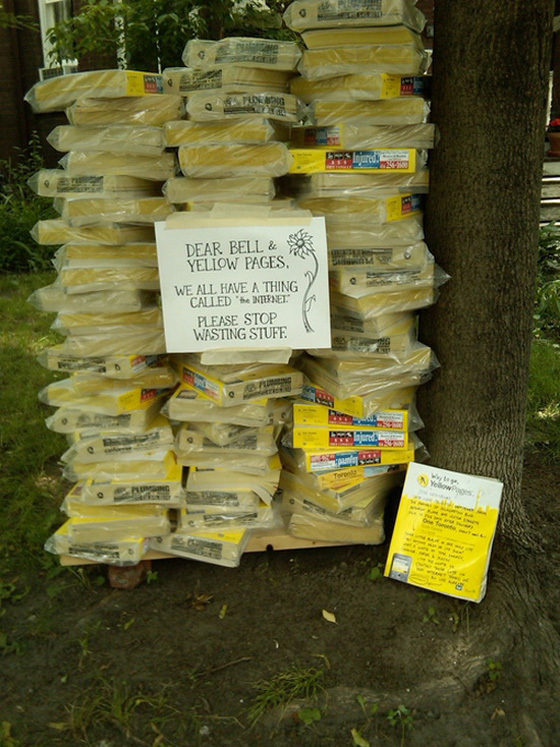 In the meantime, cities like Seattle are taking steps to crackdown on the amount of phone books delivered each year. Not only does Seattle impose a $0.14 fee for every book delivered but also fines the yellow page publishers $125 for delivering phone books to people who have opted out of receiving them. Read the full story here to see what else Seattle is doing to crackdown on phone book deliveries. this story is in Marketing & Brands, Toll Free & Local Numbers with helpful hints for your entrepreneurial journey.